It seems like everyone is in love with coconut oil in every capacity right now: as a moisturizer, a makeup remover, or as a cooking oil. In the past, I’ve tried to use it as lotion, but found it not to my liking as I am super picky about absorbency. I’ve recently started dabbling with using it in the kitchen and love it steamed with my quinoa when making stir fry. After all the talk on the blog recently about natural beauty products and DIY at-home spa treatments, I was inspired to finally try a much-hyped coconut oil hair treatment. I know what you’re thinking. “Whoa. Slow down, Leigh. Your wild lifestyle will be your undoing. Your lifestyle will be so wild, we’ll have to spell it ‘wyld lifestyle. '” But, what can I say, it was Friday night and I was feeling crazy. 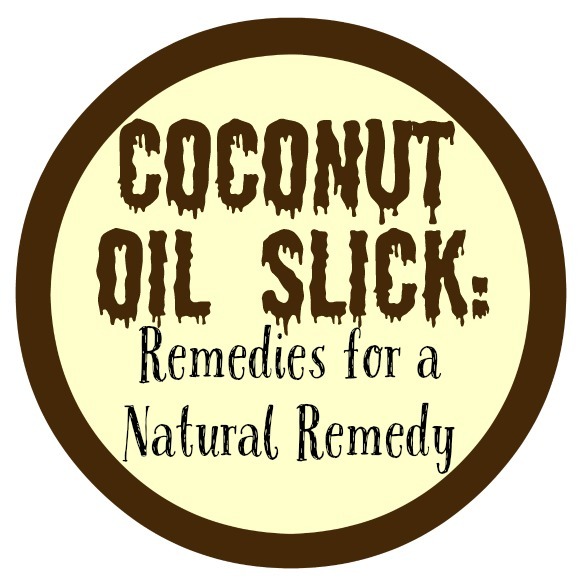 I cursorily read some internet articles on the subject– all suggesting working two to three teaspoons of melted liquid coconut oil through your hair and then rinsing. I put my jar of (not for cooking) coconut oil in the shower and let the water steam heat the jar. Since many of the blogs mentioned that those with thick hair would use more than the suggested two to three teaspoons, I liberally applied around a quarter of a jar to my dry hair, saturating it. I got out of the shower and put on a shower cap. 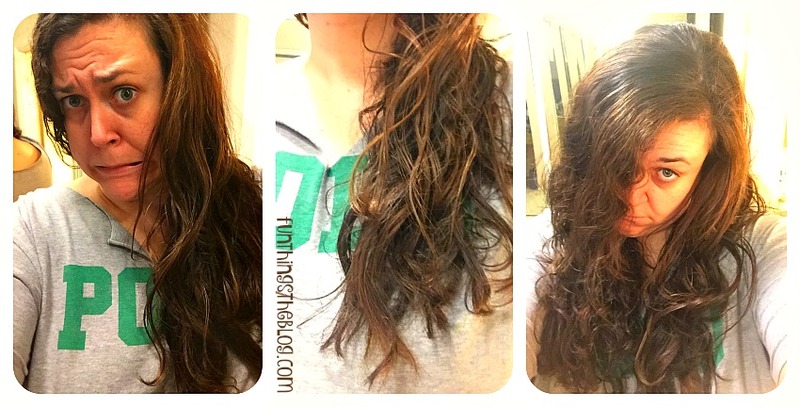 I then waited the prescribed two hours for the “really deep treatment” with dreams of having the softest hair in all the land and all the blog posts I would write about how natural my routine had become. Cut to me back in the shower for the second time that night. I rinsed with several tablespoons of Castille soap (again, an internet suggestion) as it was purportedly strong enough to get any residual oil out without stripping my hair. As I lathered, I noticed the significant texture change to my hair. It felt thicker and had a certain drag to it as I slid (or tried to) my fingers over it. Thinking that it was just the miraculous powers of coconut oil, I hopped out of the shower and, as mentioned in our beauty routine post, turbaned it up in a t-shirt to dry. After doing all my other bathroom ablutions, I took down my turban and felt my hair. It didn’t feel particularly wet, which I thought was odd, but I was (again) already writing the blog post in my head about how coconut oil cut down dry time. I let my hair air-dry throughout the rest of the evening, but it never really seemed to dry, so much as harden. I even pulled out my blow-dryer (which I never rarely do) to see if it was a heat thing. It was not a heat thing. Except now it was past my bedtime, and I had already taken two showers, and had spent all the energy I was going to spend on my hair for the evening. I laid a towel across my pillow to prevent the grease from soaking through and ruining my bedding and went to sleep. All the while, Dr. Nick Riviera’s sage advice rang through my head, “remember, if you’re not sure about something, rub it against a piece of paper. If the paper turns clear, it’s your window to weight gain…”. I’m all about cracking some eggs for breakfast, but when the first thing you do on a Saturday morning at 7:30 is to crack two eggs… into your hair, you know something is amiss. After leaving the blissfully unencumbered Jojo snoozing, I took my third shower in two days. The eggs were another suggestion from the internet as they are clarifiers and part of many DIY hair mask treatments. Just more spa stuff, right? Except, at this point, it isn’t. Doing the smartest thing I’d done all day, I finally texted my hair stylist (and life guru) Julie and explained the situation. After she (rightly) cackled at me, she then very helpfully explained to me that coconut oil, unlike most other oils, doesn’t coat the hair shaft, it gets absorbed INTO it. It’s one of the reasons why oil is so dangerous to birds and animals during spills and why great buoys of hair sausages are used to clean up (seriously, click on the hair sausage link, it’s fascinating!). And just as one cannot simply walk into Mordor, one also cannot just put loads of coconut oil in ones hair. There was always the nuclear option of rinsing my hair with Dawn dish detergent (which is used in oil spill cleanups, supposedly), but the whole point of this experiment was to help my hair, not hurt it and Dawn pretty much strips everything. In order to prevent this it, she suggested trying to absorb it through baking soda (sound familiar? ), corn starch, and dry shampoo first. After checking the internet (more thoroughly this time), it turns out that there are dumdums like me everywhere who are having problems with coconut oil hair masks. And just like there are large swathes of the internet devoted to how great coconut oil is, there are also large areas devoted to ‘OMGOMGOMGgetthisstuffOFFMYHAIR’. The internet recommended apple cider vinegar as well as hair conditioner (on the theory of like removing like). So, it was back to the bathroom and shower for the fourth time in two days. Fortunately, I had a can of dry shampoo with which I wasn’t in love and I proceeded to hot box my bathroom with aerosol fumes. I also broke out and used more corn starch on my scalp than I ever have in the kitchen. After I thoroughly powdered my hair, I flipped my head over and poured apple cider vinegar through my hair. Whether it was good for my hair, I know not, but it was certainly good/pungent for my sinuses. I rinsed out my baking cupboard from my locks and still could feel a drag when I ran my fingers across. I, then, applied an excessive amount of conditioner and left it on for 15 minutes while I shaved and showered. After rinsing, my hair felt suspiciously squeaky clean, so I was worried I had stripped it. After it dried, I discovered that I had… sort of. 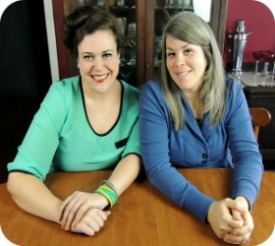 I had not permanently damaged my hair, but I had certainly removed any and all oil or product buildup in my hair. 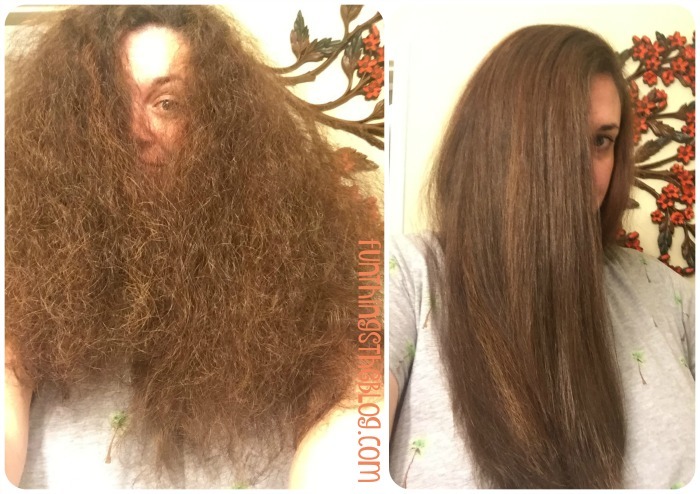 When it dried, I couldn’t believe how incredibly light my hair felt compared to how laden down it felt carrying a cup of solid coconut oil on my dome for 24 hours. As I applied a reasonable pump of my favorite argon oil styling cream, I laughed at the irony. I straightened my hair, and there were still a couple clumps that were a little oily, but (this past weekend) I learned the difference between kind of greasy and ohnonononononononono. Talk about being hoisted by your own petard!? But, here’s the funny thing. This is actually NOT the first time I have found myself slicked down with impossible to remove petroleum in my hair. The Sunday before my third grade school picture day, I (in an early and desperate attempt to control the emerging frizz that puberty had wrought) applied a handful of Vaseline to my bangs. I can still put myself right back in that moment with my head, face down, craned and crinked over my childhood kitchen sink; my mom repeatedly trying (in a world before internet suggestions) to get the Vaseline out with varying success as evidenced by the picture (at right) from the archives. Fool me once, shame on you. Fool me twice? Well, lesson learned. When I look back on this weekend full of coconut oil, eggs, corn starch, baking soda, and apple cider vinegar, I wonder… did I help my hair? Or make a meringue? 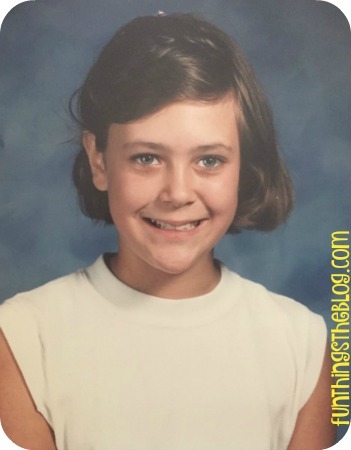 Do you have a school picture day horror story? Have you been burned by a DIY at-home treatment? Have you heard of hair sausages? As always, let us know in the comments! Just chuckling to myself here. I do use coconut oil in my hair, but just (to use my stylist’s term) “a booger’s worth” for my short, fine hair. It improves drying time a lot! If I’m wanting something deeper, I apply it an hour before the shower to let it soak in first, then wash and condition as usual. Then I dry my hair and rather than using another product, if it still needs a little something extra, I use just a tiny bit more and rub it all over my hands and then style my hair as intended. I am going into my first winter using this method, so I’m interested to see how it continues, but this summer has been great! Good luck in your future treatments! Ohhhhhh. I tried to use coconut oil on my face… um, it burned! Your final straight hair was pretty! Yeah. I’m not allergic to it, but it definitely makes me break out. But, MAN… some people swear by it.